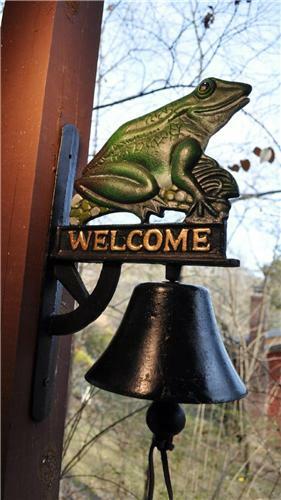 This is a very nice New Cast Iron Frog Welcome Sign Bell that is great for the outdoor Garden, Deck, Patio, or Home Entryway for your Home or Office Decor. Quite heavy (over 7 pounds!) the solid cast iron is nicely painted with attractive attention to detail on both sides. This bell rings loud too! You'll be glad you found this one and these won't last long. New Cast Iron Bear Towel Ring Wall Decor with Vintage Primitive Look!